The mechanism of mouse parturition is thought to involve myometrial infiltration by amniotic fluid (AF) macrophages, activated by surfactant protein-A (SP-A). In humans, the concentration of AF SP-A decreases during labor, and no fetal macrophages are found in the myometrium after labor. Therefore, it appears that the mechanisms of labor in mice and humans are different. We investigated a potential role for SP-A in human pregnancy and parturition by examining SP-A expression patterns in AF and amnion. High molecular mass (>250 kDa) oligomeric SP-A was increased in AF with advancing gestation. Interestingly, these oligomers were more abundant in placental amnion before labor at term, while they increased primarily in reflected amnion during labor (p < 0.05). Immunoblotting showed a binding of high molecular mass SP-A in AF to amnion. In C57BL/6 mice, oligomeric SP-A was also readily detected in AF from E15 onwards, but not in amnion. Macrophage density in mice myometrium did not change with advancing gestational age. Microarray analysis of human amnion explants incubated with SP-A revealed a molecular signature of inhibited cytokine–cytokine receptor interaction with downregulation of IL-1β, CXCL2, and CXCL5 mRNA expression. The findings in this study strongly suggest that SP-A signals amniotic anti-inflammatory response via AF during pregnancy. We propose that an SP-A interaction among AF, placental amnion, and reflected amnion is a unique mechanism for immunoregulation in human pregnancy akin to that established in lung biology. However, AF SP-A and fetal macrophages by themselves do not seem to be exclusive effectors of parturition in humans. Human spontaneous labor at term has a prominent proinflammatory molecular signature in the chorioamniotic membranes, particularly in the amnion (1, 2). This strongly suggests that human parturition has a physiologic inflammatory and immunologic component, and also that the molecules that modulate amniotic proinflammatory responses play important roles in parturition. The amnion is a large mucosal surface stretched across the intrauterine surface, which reaches up to 1,876 ± 307 cm2 at term (3), and is the inner layer of the chorioamniotic membranes. The amnion is in direct contact with the amniotic fluid and plays pivotal roles in the induction of labor by producing PGs and in delivery by membrane rupture (4). Recently, we demonstrated that the human amnion is biologically compartmentalized into the placental amnion (amnion overlying the placental disc) and the reflected amnion (amnion of the extraplacental chorioamniotic membranes). Of note, the labor-associated proinflammatory response was a more prominent feature in the placental amnion rather than in the reflected amnion (2). Previous studies have shown that inflammation activates amniotic biologic cascades associated with human labor. For example, proinflammatory cytokines IL-1 and TNF-α stimulated the production of PGE2 and induced cyclooxygenase-2 expression in the amnion (5, 6). IL-1β and TNF-α increased IL-8 expression in the amnion cells (7). Moreover, intra-amniotic infection is the leading identifiable cause of preterm labor and delivery (8). During pregnancy, the biochemical composition of amniotic fluid changes as gestational age advances, and this could have an effect on the biology of the amnion. Conversely, the molecules produced by the amnion could change their amniotic fluid concentrations. In this context, it is reasonable to expect that a certain molecule, whose amniotic fluid concentration changes with progression of gestation and modulates amniotic inflammatory responses, plays an important role in human pregnancy and parturition. Surfactant protein-A (SP-A) is a C-type lectin encoded by SFTPA1 and SFTPA2 (9, 10), with a triple helical collagen region on the N-terminus and a carbohydrate recognition domain on the C terminus (11, 12). It is expressed by both the lung and the chorioamniotic membranes (13–16). SP-A characteristically shows a marked increase in the amniotic fluid with advancing gestational age, and this is taken as an indicator of fetal lung maturity (17). Because its concentration sharply increases during the third trimester [compared with that of SP-D (18)], SP-A is an attractive candidate to control human parturition because it would link fetal maturity with the onset of labor. Indeed, intra-amniotic administration of SP-A was shown to induce parturition in mice, and treatment with a neutralizing Ab prolonged gestation in that species. Therefore, it has been proposed that activation of fetal amniotic fluid macrophages by SP-A and their subsequent migration into the maternal myometrium are key events for spontaneous parturition in mice. The injection of neutralizing anti–SP-A Ab into the amniotic cavity delayed mouse parturition (19, 20). However, fetal macrophages have not been found in the myometrium of women after spontaneous labor at term (21, 22), and amniotic fluid SP-A concentration decreases during human spontaneous labor at term (23). Therefore, a puzzling difference in the role of SP-A between humans and mice has emerged. We hypothesized that decreased amniotic fluid SP-A concentration during human labor at term might be a consequence of sequestration of SP-A by its receptor molecules in the chorioamniotic membranes, particularly within the amnion (23). Because human amnion expresses known receptors of SP-A, such as TLR2 and TLR4, which are critical to immunologic responses (24–26), it is likely that amniotic fluid SP-A modulates the amniotic inflammatory response. It was also shown that the globular heads and the collagen-like tails of SP-A could mediate anti-inflammatory and proinflammatory responses by binding to signal-regulatory protein α (SIRPα) and to calreticulin/low-density lipoprotein-related protein 1 (CD91), respectively, thus conferring dual immunomodulatory roles for SP-A (27). However, the primary immunologic effect of SP-A on the human amnion and its biologic significance in the amniotic cavity has not been investigated to date. This study was performed to assess immunologic and functional aspects of SP-A in human pregnancy and parturition. Samples of human amnion and amniotic fluid were retrieved from the Bank of Biological Materials held at the Perinatology Research Branch, Eunice Kennedy Shriver National Institute of Child Health and Human Development, National Institutes of Health (Detroit, MI). Placental amnion and reflected amnion were obtained using blunt dissection as previously described (2). The study groups were composed of women at term not in labor (TNL; n = 28) and at term in labor (TIL; n = 19). To achieve the separation of amnion epithelium and mesoderm, reflected amnion samples obtained from TIL patients were used (n = 5). The amnion was rinsed and soaked in PBS for 10 min at room temperature, and the mesodermal layer was meticulously scraped off using a razor blade. Amniotic fluid samples (n = 35) were obtained by amniocentesis for clinical indications at different gestational ages. Fetal lung tissue was obtained from an autopsy case of fetal demise at the gestational age of 33 wk, and amniotic fluid and amnion from the same patient were also obtained for comparison. All patients provided written, informed consent, and the collection and use of the samples were approved by the institutional review boards of the participating institutions. Human amnion cells were obtained from the reflected amnion of TNL patients and incubated for 6 h with DMEM (Mediatech, Washington, DC) containing 2.5% (v/v) amniotic fluid and 10% FBS. Human reflected amnion explants (2.5 × 2.5 cm) obtained from TNL patients were incubated for 6 h with DMEM and 2.5% amniotic fluid preadsorbed with rabbit polyclonal neutralizing anti–SP-A Ab (Chemicon International, Temecula, CA) or normal rabbit sera, and harvested after washing with PBS. 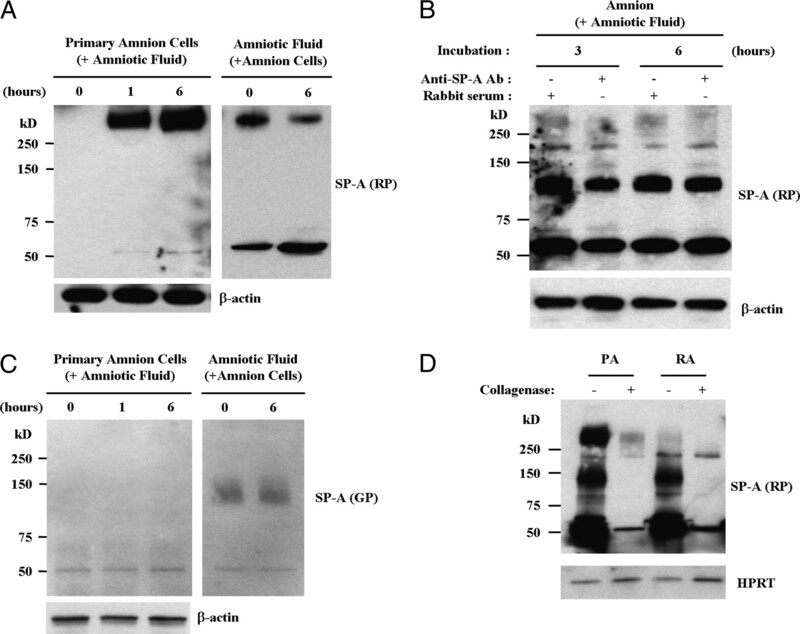 For the analysis of the extent of extracellular SP-A binding in the amnion, the amnion tissues were treated with 2% collagenase (Worthington Biochemical Corporation, Lakewood, NJ) at 37°C for 30 min and used for protein isolation. This study was approved by the Animal Investigation Committee of Wayne State University, Detroit, Michigan. Timed pregnant female C57BL/6 mice (n = 16; Charles River Laboratories, Wilmington, MA) were maintained in an animal facility under pathogen-free conditions. Mice were sacrificed on E13, E15, E17, and E19. Fetal uterine, placental tissues, and amniotic fluid were collected. Proteins were extracted from liquid nitrogen-pulverized amnion, fetal lung tissue, or cell pellets using radioimmunoprecipitation lysis buffer (Sigma-Aldrich, St. Louis, MO) containing a proteinase inhibitor mixture (Roche, Basel, Switzerland). Protein lysates underwent electrophoresis in 4–15% gradient SDS-PAGE (Bio-Rad, Hercules, CA) under reducing or nonreducing conditions and then electroblotted onto polyvinylidene difluoride membranes (GE Healthcare Bio-Sciences, Piscataway, NJ).After blocking for 1 h with 5% nonfat dry milk in TBS containing 0.1% Tween 20 (0.1% TBS-T), the membranes were incubated with primary Abs specific to SP-A (rabbit polyclonal [Chemicon International], goat polyclonal [Chemicon International], mouse monoclonal [AntibodyShop, Gentofte, Denmark]), CD91 (mouse monoclonal, 5A6; Abcam, Cambridge, MA), calreticulin (mouse monoclonal, FMC75; Abcam), SIRPα1 (rabbit polyclonal, Upstate Biotechnology, Lake Placid, NY), TLR4 (mouse monoclonal; Santa Cruz Biotechnology, Santa Cruz, CA), MD2 (rabbit polyclonal, Abcam), TLR2 (rabbit polyclonal, Abcam), HPRT (rabbit polyclonal, Santa Cruz Biotechnology), β-actin (mouse monoclonal, Sigma-Aldrich), and GAPDH (mouse monoclonal, Sigma-Aldrich) at 4°C overnight. HRP-conjugated anti-mouse IgG, anti-rabbit IgG, or anti-goat IgG (Santa Cruz Biotechnology) was used as a secondary Ab. Signals were detected by chemiluminescence. Amnion proteins were obtained using lysis buffer (pH 8.0) containing 150 mM NaCl, 50 mM Tris-HCl, 1% NP-40, and a proteinase inhibitor mixture. A total of 125 μg of protein lysates were preincubated with protein G agarose (Upstate Biotechnology Inc.) for 2 h on a rotary shaker, and then specific primary Abs and CaCl2 (final concentration: 1 mM) were added for overnight incubation at 4°C. After washing, immune complexes harvested with protein G agarose were eluted and subjected to electrophoresis in SDS-PAGE under nonreducing conditions for further analysis. Immunoblotting was carried out as described above. Double-label immunofluorescent staining on human amnion tissue was conducted using a panel of Abs to SP-A (rabbit polyclonal, Chemicon International), CD68 (mouse monoclonal, Chemicon International), CD91 (mouse monoclonal, Zymed, San Francisco, CA), and TLR4 (mouse monoclonal, Santa Cruz Biotechnology). Five-micrometer–thick frozen tissue sections of reflected amnion tissues (TIL, n = 3) or intact (whole mount) placental amnion tissues (TNL, n = 3) were fixed with 4% (w/v) paraformaldehyde or 85% (v/v) ethanol, permeabilized with 0.25% Triton X-100, and incubated with 5% (w/v) BSA in PBS for 30 min at room temperature. Sections or tissues were incubated with a primary Ab in 1% (w/v) BSA in PBS for 1 h, followed by incubation with Alexa 488 goat anti-mouse IgG and Alexa 594 donkey anti-rabbit IgG (Invitrogen, Carlsbad, CA) in 1% (w/v) BSA for 30 min and mounted in ProLong Gold antifade reagent with DAPI (Invitrogen). The stained sections were examined using a Leica TCS SP5 spectral confocal system (Leica Microsystems, Wetzlar, Germany). To assess whether immunoreactive bands corresponding to medium molecular mass and high molecular mass SP-A represent oligomeric SP-A, 2.5 μl of amniotic fluid obtained by amniocentesis for amnioreduction in a twin pregnancy at the gestational age of 29 wk and 10 ng of SP-A isolated from bronchoalveolar lavage fluid of a patient with pulmonary alveolar proteinosis (a gift from Dr. J.A. Whitsett, University of Cincinnati College of Medicine, Cincinnati, OH) were resolved in 4–15% gradient SDS-PAGE under nonreducing conditions. The pieces corresponding to 50–65 kDa, 150–250 kDa, and >250 kDa were cut from the gel and homogenized using liquid nitrogen. The proteins in gel homogenates were isolated using Laemmli Sample Buffer (Bio-Rad). Isolated proteins underwent electrophoresis again in 4–15% gradient SDS-PAGE under reducing conditions, and immunoblotting was performed with anti–SP-A Ab (mouse monoclonal, AntibodyShop). For two-dimensional gel electrophoresis, protein samples extracted with ReadyPrep Rehydration/Sample Buffer (Bio-Rad) were rehydrated with 7 cm IPG strip (pH 4–7; Bio-Rad) at room temperature for 12 h followed by isoelectric focusing using a PROTEAN IEF Cell (Bio-Rad). Voltages were applied at 250 volts for 20 min, followed by 4000 volts for 2 h and 4000 volts up to 10,000 volt h. The focused IPG strips were equilibrated and run on 4–15% gradient Mini-PROTEAN Ready Gel with IPG comb (Bio-Rad) followed by immunoblotting with mouse monoclonal anti–SP-A Ab. To further characterize the oligomeric nature of high molecular mass SP-A in amniotic fluid and the specificity of immunoreactive bands, 25 μl of amniotic fluid were immunoprecipitated with rabbit polyclonal anti–SP-A Ab (Chemicon International) as previously described. Amniotic fluid immunoprecipitates and purified SP-A were resolved in 4–15% gradient SDS-PAGE under nonreducing conditions, the region corresponding to the high molecular mass SP-A immunoreactive band (>250 kDa) was cut from the gel, and proteins were extracted as described earlier. Isolated proteins underwent electrophoresis in 4–15% gradient SDS-PAGE under reducing conditions. Both immunoblotting for SP-A and Coomassie blue staining were performed. After destaining, slices corresponding to SP-A bands (32 and 64 kDa) were cut and analyzed by liquid chromatography-tandem mass spectrometry (LC-MS/MS). Gel slices were cut into 1 mm3 cubes and each was washed with water for 15 min; the liquid was replaced with 50 mM ammonium bicarbonate (AB)/acetonitrile (ACN; 1:1, v/v). Liquid was removed and gel plugs were shrunk with ACN. The gel pieces were rehydrated with AB, and after 5 min an equal volume of ACN was added. After 15 min, the liquid was removed, and ACN was added. After shrinking the gel plugs, the ACN was removed and the gel pieces dried in a vacuum centrifuge. The gel plugs were allowed to swell in 10 mM DTT/AB and then to reduce for 1 h at 55°C. After reaching room temperature, the excess liquid was replaced with 55 mM iodoacetamide/AB and incubated for 1 h in the dark. The liquid was removed and the gel plugs were washed twice for 15 min with AB/ACN (1:1). The gel pieces were shrunk with ACN and dried as explained above. In-gel digestion was performed overnight at 37°C after the addition of sequencing grade trypsin (Sigma-Aldrich) in 25 mM AB. Peptides were extracted from the gel plugs the next day using two rounds of the following protocol: 1) water was added to the gel pieces, which were then incubated for 15 min; 2) an equal volume of ACN was added, sonicated for 2 min, and incubated for 15 min; 3) excess liquid was transferred to an Eppendorf tube and the gel pieces were shrunk with ACN; and 4) after 15 min, excess ACN was transferred to an Eppendorf tube. Volatile buffers and salts of the peptides were removed during two rounds of drying and resolubilizing in water. Peptides were resuspended in 5% ACN, 0.1% formic acid, and 0.005% TFA, and separated by reverse phase chromatography (Magic C18 column, Michrom BioResources, Michrom Bioresources, Auburn, CA). Peptides were ionized with the ADVANCE ion source (Michrom BioResources) and introduced into an LTQ XL mass spectrometer (Thermo Fisher Scientific, Pittsburgh, PA). Abundant species were fragmented with collision-induced dissociation. Data analyses were performed using BioWorks (Thermo Fisher Scientific) and Scaffold (Proteome Software, Portland, OR) software that incorporated SEQUEST and ProteinProphet algorithms. A human protein database (IPI ver. 3.49; EMBL-European Bioinformatics Institute, Cambridge, U.K.) was used for the analysis. To study the effects of SP-A treatment in the amnion, microarray experiments were conducted. Human reflected amnion explants (2.5 × 2.5 cm) obtained from TNL patients (n = 6) were kept in DMEM media containing 0.5% FBS for 1 h and were treated with purified SP-A. Vehicle (distilled water) and SP-A were negative for endotoxin to <0.005 EU/ml for the water and <0.005 EU/μg for SP-A. The amnion explants were treated with SP-A at a final concentration of 1 μg/ml for 12 h, and total RNA was isolated using TRI reagent (Applied Biosystems/Ambion, Austin, TX). After purification of total RNA samples using an RNeasy Mini Kit, 100 ng of total RNA were amplified and biotin-labeled with the Illumina TotalPrep RNA Amplification kit (Ambion). Labeled cRNAs were hybridized to Illumina's HumanHT-12 v3 expression BeadChips. BeadChips were imaged using a BeadArray Reader, and raw data were obtained with BeadStudio Software (Illumina, San Diego, CA). After logarithmic transformation, the bead-level expression intensities were normalized using the quantile normalization algorithm (28). A paired moderated t test using the limma package (29) of Bioconductor was used to gauge the effect of treatment on gene expression levels. Combined criteria were used to identify differentially expressed probes, which included a false discovery rate, (30) adjusted p < 0.25, and a fold-change >1.5. The differentially expressed genes were further analyzed to identify enriched gene ontology terms, such as molecular functions and biologic processes, using the GOstats package (31) of Bioconductor. Moreover, pathway analysis was performed using an overrepresentation approach on the Kyoto Encyclopedia of Genes and Genomes (KEGG) human signaling and metabolic pathways database (www.genome.jp/kegg/). For the signaling pathways available in KEGG, the signaling pathway impact analysis (SPIA) algorithm (32, 33) was applied to make full use of the pathways topology and the directed gene-gene interactions to assess pathway significance. This later analysis was performed using the SPIA package of Bioconductor. The complete microarray data set is available in a Minimal Information About a Microarray Experiment-compliant format in the ArrayExpress database (www.ebi.ac.uk/microarray-as/ae) [entry ID:E-TABM-741]). To validate the microarray analysis results, expression of select cytokine and chemokine genes were analyzed using TaqMan gene expression assays for IL-1β (HS00174097_m1), CXCL2 (HS00236966_m1), CXCL5 (HS00171085_m1), and CCL3 (HS00234142_m1). Amniotic total RNA was reverse transcribed using ImPromII reverse transcriptase and oligo(dT) primers (Promega, Madison, WI), and subsequently used for PCR. PCR was done using an ABI 7500 Fast Real-time PCR System (Applied Biosystems). The human ribosomal protein, large, P0 (RPLP0, Applied Biosystems) was used for standardization of PCR results. Human amniotic fluid samples obtained by amniocentesis were added to PreservCyt transport medium (Cytyc, Marlborough, MA), and the slides for cytologic examination were prepared using a ThinPrep 2000 processor (Cytyc Corporation). Immunohistochemical staining was performed for CD68 using a mouse monoclonal anti-CD68 Ab (Dako North America, Carpinteria, CA). The amniotic fluid samples obtained from five patients were analyzed. Cord blood samples from the same patients were available in two cases and used as positive controls for CD14 staining (data not shown). To stain cord blood, whole blood (100 μl) anti-coagulated with EDTA was incubated for 30 min at 4°C with allophycocyanin-conjugated isotype control or allophycocyanin-conjugated mouse anti-CD14 (BD Biosciences, San Jose, CA). RBCs were lysed by incubation with 1× FACS Lysing Solution (BD Biosciences), and the cells were pelleted by centrifugation at 300 × g for 5 min, and washed twice with PBS. Stained cells were finally suspended in 1% paraformaldehyde in PBS for flow cytometric acquisition. Amniotic fluid was centrifuged at 300 × g for 5 min, washed with PBS, resuspended in BD staining buffer (BD Biosciences) and stained as whole blood. All acquisition and analyses were performed with an LSRII flow cytometer (BD Biosciences). To evaluate intramyometrial macrophage density, immunostaining was performed using a rat monoclonal anti-F4/80 Ab (Serotec, Oxford, U.K.). The numbers of F4/80 positive macrophages were counted in the myometrial sections containing the midplane of the placenta from four pregnant mice at each gestational age (E13, E15, E17, and E19). Eight high-power fields corresponding to every 45-degree-angle point starting from the mesometrial border in a clockwise direction, covering the entire myometrial circumference, were evaluated in each section. Image-Pro Plus 6.2 software (Media Cybernetics, Silver Spring, MD) was used for the analysis. The Mann-Whitney U test was used to compare the relative densities of high molecular mass SP-A oligomers in the reflected amnion between TIL and TNL cases. Comparisons of protein expressions between different anatomical structures (epithelium versus mesoderm, placental amnion versus reflected amnion) and quantitative RT-PCR data obtained from amnion explants according to SP-A treatment were analyzed using the Wilcoxon signed-rank test. The Kruskall-Wallis test was used for the analysis of myometrial macrophage counts at each mouse gestational age. SPSS version 15.0 (SPSS, Chicago, IL) was used for statistical analysis. Values of p < 0.05 were considered statistically significant. The methods used for microarray analysis have been described above. Upon immunoblotting for SP-A using amniotic fluid, amnion, and fetal lung samples (all obtained from a single fetal demise case at the gestational age of 33 wk) in both reducing and nonreducing gel electrophoresis conditions, anti–SP-A Abs generated from different species (rabbit polyclonal, goat polyclonal, and mouse monoclonal as described above) showed different immunoreactive patterns. The immunoblotting results clearly indicated that SP-A is largely present in oligomers in vivo. The major SP-A bands corresponded to nonreducible dimers and supratrimeric oligomers. Under nonreducing conditions (Fig. 1A), the rabbit polyclonal anti–SP-A Ab most effectively detected high molecular mass (>250 kDa) SP-A oligomers and nonreducible dimers. Alternatively, both goat polyclonal and mouse monoclonal anti–SP-A Abs effectively recognized medium molecular mass (75–250 kDa) SP-A oligomers. Under reducing conditions (Fig. 1B), nonreducible SP-A dimers with a molecular mass of 64 kDa were readily detected by both rabbit and goat polyclonal Abs. Monomeric SP-A polypeptides were detected by all of the Abs, particularly by the mouse mAb. Immunoreactive patterns of SP-A in human amniotic fluid, amnion, and fetal lung samples to Abs generated from different species and specificity of immunoreactive bands. A, Two microliters of amniotic fluid and 10 μg of total proteins from the amnion and the lung obtained from the same patient underwent electrophoresis in 4–15% gradient SDS-PAGE under nonreducing conditions, and subsequently electroblotted. Under nonreducing conditions, the RP anti–SP-A Ab detects high molecular mass (>250 kDa) SP-A oligomers and dimers most effectively, whereas GP and MM anti–SP-A Abs effectively recognize medium molecular mass (75–250 kDa) SP-A oligomers. B, Under reducing conditions, nonreducible SP-A dimers (64 kDa) are readily detected by both RP and GP Abs. Monomeric SP-A polypeptides are detected by all Abs, but most effectively by the MM Ab. GP, goat polyclonal; MM, mouse monoclonal; RP, rabbit polyclonal. To confirm that the amniotic fluid proteins in the high molecular mass and medium molecular mass bands detected by anti–SP-A Abs were genuine SP-A oligomers, proteins were isolated from gel slices corresponding to SP-A in high molecular mass and medium molecular mass regions subjected to electrophoresis under nonreducing conditions. For this experiment, amniotic fluid obtained from a twin pregnancy at 29 wk gestation was used. Isolated proteins underwent electrophoresis again under reducing conditions and analyzed by immunoblotting. During immunoblotting using mouse monoclonal anti–SP-A Ab, monomeric SP-A polypeptides were detected in both medium molecular mass and high molecular mass SP-A. The 50–65 kDa fraction mainly demonstrated a 64 kDa immunoreactive band, which was consistent with nonreducible dimers previously described (Fig. 2A) (34). We also performed LC-MS/MS analysis of amniotic fluid SP-A from immunoprecipitates using rabbit polyclonal Ab and purified SP-A (Fig. 2B, 2C), and confirmed that high molecular mass SP-A is an oligomeric form composed of SP-A monomers and nonreducible dimers. Mass spectra of amniotic fluid SP-A is shown in Fig. 2C and identified peptides are summarized in Table I. Furthermore, two-dimensional electrophoresis of the high molecular mass fraction of amniotic fluid SP-A (n = 3), followed by immunoblotting with mouse monoclonal anti–SP-A Ab, revealed the same isomer patterns as that of purified SP-A (Fig. 2D–G). The immunoblotting data were consistent with the observation made by He (35) that SP-A multiple isomers (mass 20.5–26 kDa, isoelectric point (pI) of 4.5–5.4; mass 26–32 kDa, pI of 4.5–5.4; mass 32–42 kDa, pI of 4.5–5.4) are found in human bronchoalveolar lavage fluid. However, isomers with molecular mass ranging from 50–75 kDa were not as prominent or absent in amniotic fluid high molecular mass SP-A compared with purified pulmonary SP-A. Characterization of SP-A in the amniotic fluid. 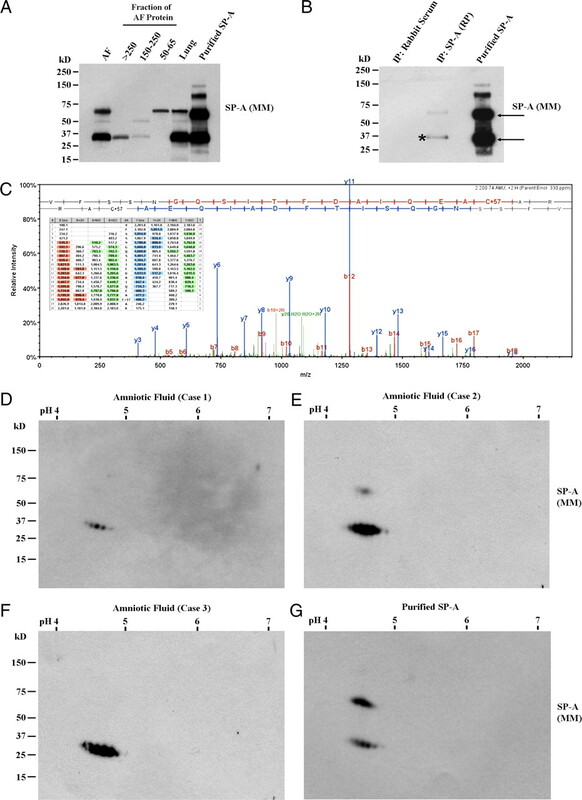 A, Amniotic fluid (AF) proteins in slices corresponding to high molecular mass and medium molecular mass bands on a nonreducing SDS-PAGE gel were extracted and resolved again by SDS-PAGE under reducing conditions. AF obtained from a twin pregnancy at 29 wk, and fetal lung tissue from an autopsy case with gestational age of 33 wk were compared. Immunoblotting with mouse monoclonal anti–SP-A Ab recognizes monomeric SP-A polypeptides in both high molecular mass and medium molecular mass fractions, while the 50–65 kDa fraction demonstrates largely nonreducible dimers (64 kDa). B, Immunoblotting using MM anti–SP-A Ab of high molecular mass SP-A fraction in the same AF (29 wk) immunoprecipitates with RP anti–SP-A Ab, and purified SP-A demonstrates an identical pattern showing monomeric SP-A (32 kDa) and nonreducible SP-A dimer (64 kDa). C, Mass spectra of monomeric SP-A shown in B (*) on LC-MS/MS analysis. LC-MS/MS analysis also confirmed SP-A in monomeric and dimeric SP-A (arrows) in purified SP-A (data not shown). D–G, Two-dimensional electrophoresis and SP-A immunoblotting profiles of amniotic fluid samples and purified SP-A. High molecular mass SP-A fraction of AF proteins from three cases (D, 29 wk; E, 38 wk; F, 37 wk). G, Purified SP-A. Electrophoresis was done under reducing conditions followed by immunoblotting with MM anti–SP-A Ab demonstrates the same isomer patterns as that of purified SP-A. However, the upper bands representing nonreducible dimers were hardly detected in all of the AF samples compared with purified SP-A. Evaluation of amniotic fluid SP-A throughout gestation using both rabbit polyclonal and goat polyclonal Abs, revealed that high molecular mass SP-A oligomers, not medium molecular mass SP-A oligomers, increased with advancing gestational age and became a predominant form in the amniotic fluid in third-trimester cases (Fig. 3A, 3B). Oligomeric SP-A bands were also readily detected in the human reflected amnion. A comparison of reflected amnion samples obtained from TNL and TIL patients showed a significant increase in high molecular mass SP-A oligomers after labor on densitometric analysis (p < 0.05; Fig. 3C–E). Expression patterns of SP-A in the amniotic fluid and the amnions of humans and C57BL/6 mice. A and B, Immunoblot analysis of amniotic fluid samples obtained across gestational periods shows a clear correlation between gestational age and the high molecular mass oligomeric SP-A expression level detected by the RP anti–SP-A Ab. Two microliters of amniotic fluid samples underwent electrophoresis in 4–15% gradient SDS-PAGE under a nonreducing condition. C and D, SP-A immunoblotting of the reflected amnion samples shows more prominent high molecular mass (>250 kDa) oligomeric SP-A in the cases with labor. The difference is less prominent for medium molecular mass (75–250 kDa) SP-A which was detected using the GP anti–SP-A Ab. Ten micrograms of amnion samples underwent electrophoresis in 4–15% gradient SDS-PAGE under a nonreducing condition. E, Densitometric comparison of high molecular mass SP-A oligomers shows a significant increase of high molecular mass SP-A oligomers in the reflected amnion of TIL cases compared with TNL cases. F, Immunoblotting of C57BL/6 mouse amniotic fluid using the RP anti–SP-A Ab also shows increasing oligomeric SP-A as gestation progresses. High molecular mass SP-A oligomers are readily detectable in E17. Two microliters of amniotic fluid samples underwent electrophoresis in 4–15% gradient SDS-PAGE under a nonreducing condition. G, In contrast to the findings for the human amnion, mouse fetal membranes do not show oligomeric forms of SP-A. Ten micrograms of fetal membrane samples underwent electrophoresis in 4–15% gradient SDS-PAGE under a nonreducing condition. To compare amniotic fluid SP-A profiles of humans and mice, samples of amniotic fluid and fetal membranes obtained from timed-pregnant C57BL/6 mice (E13, E15, E17, and E19) were analyzed. As in humans, nonreducible dimers and supratrimeric oligomers of SP-A were also readily detected in mouse amniotic fluid from the gestational age of E15 and gradually increased (Fig. 3F). High molecular mass SP-A oligomers were evident from E17. However, in contrast to humans, supratrimeric SP-A was not detected in the fetal (extraembryonic) membranes of the placenta (Fig. 3G). The next line of investigation was conducted to determine whether SP-A oligomers in the amnion are, at least in part, originating from the amniotic fluid, because there was a reciprocal relationship between amniotic fluid SP-A concentration and high molecular mass oligomeric SP-A in the reflected amnions of TIL patients (23). Immunoprecipitation of amnion lysates obtained from TNL and TIL patients using Abs against SP-A, SIRPα, calreticulin, MD2, and TLR2, and subsequent immunoblotting for SP-A, showed coimmunoprecipitation of SP-A with these known receptor molecules tested (Fig. 4A, 4B). Immunofluorescent staining of the placental amnion for SP-A, CD91, and TLR4 demonstrated distinct colocalizations of SP-A with CD91 (Fig. 4C) or TLR4 (Fig. 4D) in the epithelium. Binding of SP-A to SP-A receptors in the human amnion. 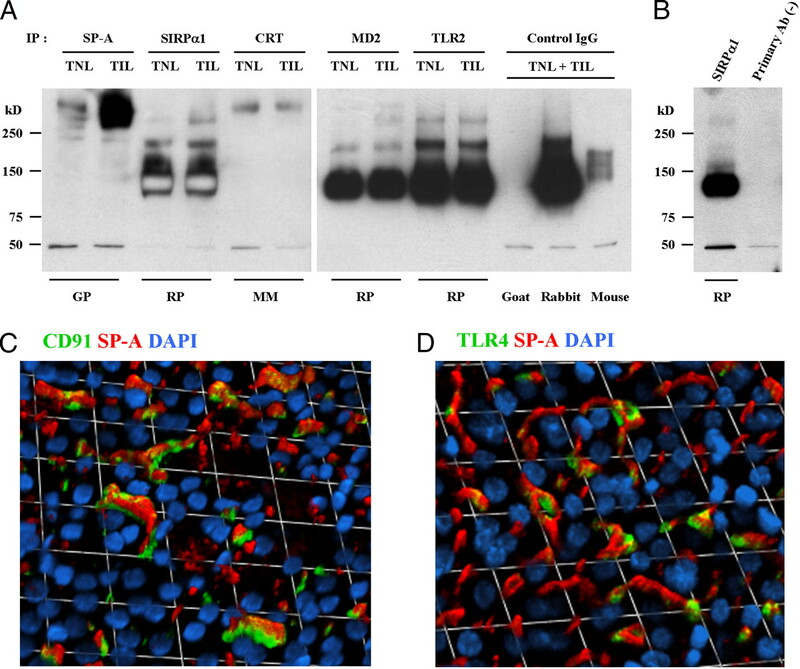 A, Human amnion protein lysates (125 μg) were immunoprecipitated using specific Abs to SP-A and known SP-A receptors, such as SIRPα, calreticulin (CRT), MD2, and TLR2, and subsequently probed with anti–SP-A Ab. For isotype control experiments to assess specificities of immunoprecipitive reaction, equal amount of proteins were pooled from the same TNL and TIL cases and used. The blot demonstrates coimmunoprecipitation of oligomeric SP-A to SIRPα, CRT, MD2, and TLR2. The species of the primary Ab host used for immunoprecipitation reaction are shown at the bottom of the gel. SP-A immunoblots were done using a rabbit polyclonal Ab. B, The result of immunoprecipitation in the absence of primary Ab is shown next to the one from SIRPα immunoprecipitation. The same pooled proteins (TNL + TIL) were used. C and D, Immunofluorescent images of the amnion show distinct colocalizations of SP-A with CD91 (C) or TLR4 (D) in the amnion epithelium. Immunofluorescent staining was performed on placental amnion whole mount samples obtained from three TNL cases, and the images were taken from the amnion epithelial layer of a representative case. Furthermore, incubation of primary amnion cells obtained from TNL patients with amniotic fluid depleted high molecular mass oligomeric SP-A in amniotic fluid in a time-dependent manner, with a reciprocal increase of high molecular mass oligomeric SP-A in amnion cells (Fig. 5A). The high molecular mass oligomeric SP-A was not detected in the amnion incubated with amniotic fluid in the presence of neutralizing anti–SP-A Ab (Fig. 5B), showing that high molecular mass oligomeric SP-A in the amnion largely originates from amniotic fluid. Interestingly, this was not the case with medium molecular mass SP-A oligomers because they did not change after incubation with amnion cells (Fig. 5C). The extracellular binding nature of oligomeric SP-A was also supported by a drastic decrease in the intensity of high molecular mass oligomeric SP-A bands on the immunoblots after collagenase treatment of the amnion (Fig. 5D). Binding of amniotic fluid SP-A oligomers to the human amnion. A, Primary amnion cells incubated with amniotic fluid show an increase in high molecular mass SP-A oligomers in a time-dependent manner (left), while they are being depleted in the conditioned amniotic fluid (right). B, The addition of a neutralizing Ab in the amniotic fluid inhibits high molecular mass SP-A binding to the amnion explants. C, The medium molecular mass SP-A oligomers are not detected in the amnion cells after incubation with amniotic fluid (left), nor were they changed in the conditioned amniotic fluid (right). D, The SP-A oligomers in the placental amnion (PA) and the reflected amnion (RA) were decreased after treatment with collagenase. The human amnion is composed of amnion epithelium and mesoderm (connective tissue). Myofibroblasts and macrophages are major cellular subsets of the mesodermal layer (36). Upon immunofluorescent staining of the chorioamniotic membranes, SP-A immunofluorescence was found in both amniotic epithelial and mesodermal cells (Fig. 6A). Immunoblotting of amnion epithelium and mesoderm obtained from TIL patients also demonstrated more abundant oligomeric SP-A in the mesoderm compared with the epithelium (Fig. 6B). Expression patterns of known SP-A receptor molecules were also different between the two layers. Interestingly, TLR2 and MD2 expressions were higher in the mesoderm, while the expressions of other receptors, such as CD91, calreticulin, SIRPα, and TLR4, were higher in the epithelium (Fig. 6B). Differential expressions of all these proteins between the epithelium and mesoderm were significant upon densitometric analysis (p < 0.05 for all). Distribution of SP-A in the human amnion. A, Immunofluorescent staining for SP-A and CD68, a macrophage marker, demonstrates SP-A immunoreactivity in both the amniotic epithelial and mesodermal layers. In the epithelial layer, the signals are detected in both apical portion and basal portion of the cells (original magnification ×630). B, Serial immunoblotting for SP-A and its potential receptors in the amnion epithelial layer (E) and the mesodermal layer (M). SP-A is more abundant in the mesodermal layer (p < 0.05). Interestingly, the majority of the potential SP-A receptors was more abundant in the amnion epithelial layer than in the mesodermal layer (p < 0.05), with the exception of TLR2 and MD2, whose expression is clearly higher in the mesodermal layer (p < 0.05). C, Immunoblotting shows more abundant SP-A in the PA before labor, and SP-A distribution between the placental amnion and the reflected amnion RA becomes similar in labor because of to an increase in the reflected amnion and a decrease in the placental amnion. The difference in the distribution of high molecular mass SP-A between TNL and TIL cases was significant on densitometric analysis of high molecular mass SP-A oligomers in PA and RA (p < 0.01). The median RA/PA SP-A density ratio was 0.27 (range, 0.13–0.77) in TNL cases, whereas it was 1.86 (range, 0.4–3.27) in TIL cases. Among the potential receptors screened, the expression of CD91 (p = 0.05) and SIRPα (p = 0.07) tended to be higher in the PA than in the RA. TLR2 (p = 0.14) and TLR4 (p = 0.14) expressions were not significantly different between PA and RA. Previously, we showed that a prominent increase in IL-1β mRNA expression associated with labor at term was a more pronounced feature of the placental amnion rather than the reflected amnion (2). Therefore, further analyses of the distribution patterns of SP-A and receptors of SP-A (CD91, calreticulin, SIRPα, TLR2, TLR4, and MD2) between the placental amnion and the reflected amnion were performed by serial immunoblots using a panel of specific Abs. In TNL cases (n = 6), high molecular mass oligomeric SP-A was predominantly localized in the placental amnion compared with the reflected amnion, but this difference was not noted in TIL cases (n = 6), largely owing to a decrease and an increase in SP-A in the placental amnion and the reflected amnion, respectively (Fig. 6C). This difference was significant upon densitometric analysis of high molecular mass SP-A oligomers in placental amnion and reflected amnion between TNL and TIL cases (p < 0.01). The median RA/PA SP-A density ratio was 0.27 (range, 0.13–0.77) in TNL cases, while it was 1.86 (range, 0.4–3.27) in TIL cases. Among the receptors screened (CD91, calreticulin, SIRPα, TLR2, TLR4, and MD2), the expression of CD91 (p = 0.05) and SIRPα (p = 0.07) tended to be higher in the placental amnion (Fig. 6C). Because the findings indicated significant binding of amniotic fluid SP-A to the amnion, we examined the effects of SP-A in the amnion in vitro. Primary reflected amnion explants obtained from TNL patients were treated with SP-A for 12 h at the concentration of 1 μg/ml. Fig. 7A shows a “volcano plot” summarizing the differential expression of the genes between SP-A–treated and nontreated groups. Sixty-five probes corresponding to 60 unique genes met our significance criteria (Table II). More than 100 biologic processes, including angiogenesis and response to stimulus, were significantly enriched in the list of differentially expressed genes. The SPIA identified the cytokine–cytokine receptor interaction pathway as being significantly impacted, more specifically, inhibited, by the SP-A treatment. Quantitative RT-PCR analyses confirmed a significant decrease in mRNA expression of IL-1β (p < 0.05), CXCL2 (p < 0.05), and CXCL5 (p < 0.05) after SP-A treatment. 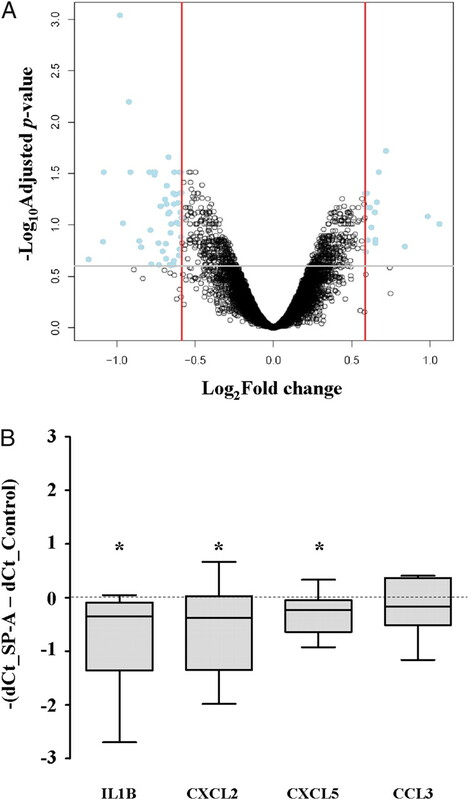 CCL3 mRNA expression was not significantly different (Fig. 7B). It has been proposed that amniotic fluid fetal macrophages play a key role in mouse parturition (19). Therefore, we determined whether macrophages were readily detectable in the amniotic fluid of humans, because a substantial number of amniotic fluid macrophages were expected if their myometrial infiltration was a key phenomenon associated with labor. Cytologic preparations of human amniotic fluid samples (n = 19), obtained at various clinical settings for different gestational periods, were analyzed by immunostaining for CD68. Macrophages were detected rarely in seven amniotic fluid samples tested (Fig. 8A), and they were not found in the rest of the samples. The demographics of the patients are summarized in Table III. Flow cytometric analyses of amniotic fluid cells obtained from five additional patients were further performed to assess proportion of CD14-positive macrophages. CD14-positive cells were not detected in three cases (gestational age, 36, 38, and 39 wk not in labor). In the remaining two cases (gestational age, 19 and 37 wk), the proportions of CD14 positive cells were 0.007% (isotype, 0.003%) and 0.004% (isotype, 0.003%), respectively (Fig. 8B). Macrophages in the human amniotic fluid (A, B) and in the myometrium of C57BL/6 mice (C, D). A, Amniotic fluid cytologic specimens show CD68 immunopositive macrophages among scattered epithelial cells. Case 4, case of a patient with intrauterine fetal demise at the gestational age of 21.4 wk. Case 15, case of a TNL patient at the gestational age of 38.7 wk (original magnification ×200; hematoxylin was used for counter-staining). B, A histogram from flow cytometric analysis of amniotic fluid cells does not show CD14 positive macrophages. The amniotic fluid was obtained from a TNL patient at the gestational age of 38 wk. Green, CD14; red, isotype. C, F4/80 immuno-positive macrophages (arrows) in the C57BL/6 myometrium obtained at various gestational ages: E13, E15, E17, and E19 (original magnification ×200; hematoxylin was used for counter-staining). D, The density of macrophages in the mouse myometrium did not change significantly across gestation. The numbers of F4/80-positive macrophages were counted in myometrial sections containing the midplane of the placenta from four pregnant mice at each gestational age (E13, E15, E17, and E19). Eight high-power fields corresponding to every 45° angle point starting from the mesometrial border in a clockwise direction, covering the entire myometrial circumference, were evaluated in each section. Image-Pro Plus 6.2 software (Media Cybernetics) was used for the analysis. The density of myometrial macrophages in C57BL/6 mice was also analyzed to see whether it increased with advancing gestational age in contrast to humans. Microscopic examination of macrophages in the mouse myometrium was done among the pregnant mice across gestational periods (E13, E15, E17, and E19). F4/80 positive macrophages were found mainly in the endometrium and sparsely in the myometrium (Fig. 8C). However, the density of macrophages in the myometrium did not change significantly across gestational periods (Fig. 8D). F4/80 positive macrophages were not found in the amnion or visceral yolk sac comprising mouse fetal membranes. 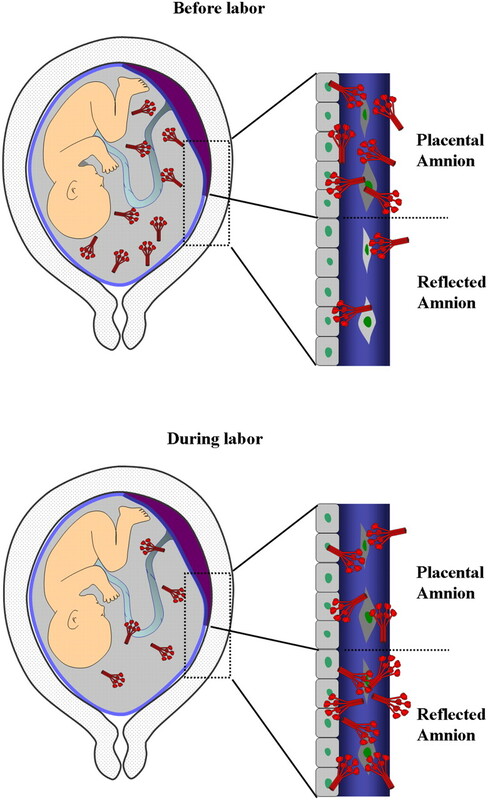 The novel findings of this study are that: 1) there is a redistribution of high molecular mass SP-A oligomers between the placental amnion and the reflected amnion with labor at term in humans (this is largely due to the increased binding of amniotic fluid SP-A to the reflected amnion); 2) amniotic binding of supratrimeric SP-A oligomers is a unique feature of human pregnancy that is not observed in C57BL/6 mice; 3) macrophages are rare in human amniotic fluid; 4) there is no significant macrophage influx into the myometrium in association with labor at term in C57BL/6 mice; and 5) SP-A treated human amnion demonstrates a molecular signature consistent with anti-inflammatory properties (inhibition of cytokine–cytokine receptor interaction). Therefore, amniotic fluid SP-A per se has modest anti-inflammatory effects on the amnion. Our data clearly show that high molecular mass SP-A oligomers (rather than monomers, dimers, or medium molecular mass oligomers) primarily increase in amniotic fluid with advancing gestational age. This finding indicates that the effects conferred by amniotic fluid SP-A as gestational age advances would be influenced more by high molecular mass oligomers. Supratrimeric SP-A oligomerization is related to the stability of collagen triple helix and ligand aggregation (37). Oligomeric SP-A distribution in the human amnion was found to be more abundant in the mesodermal layer containing fetal tissue macrophages and myofibroblasts, and it is intriguing that the receptors we screened were more abundant in the epithelial layer (36, 38). The amniotic SP-A distribution pattern in humans is in stark contrast with that observed in C57BL/6 mice. The difference in the amniotic distribution of oligomeric SP-A between humans and mice is likely due to the differences in the anatomic constitution of their respective fetal membranes. Mouse fetal membranes are primarily composed of amnion and yolk sac, and the very thin amnion proper lacks sizable amounts of stroma and macrophages as well (39), although it is possible that anti–SP-A Abs used in this study are not effective enough for assessing the distribution of different SP-A oligomers in the mouse amnion. We also wish to bring attention to the fact that SP-A genes are duplicated in humans producing two isoforms, which are able to form higher order SP-A oligomers (40). This may not be the case in mice, which have a single SP-A gene (9). The polymorphism of SP-A genes has been shown to be associated with susceptibility to certain diseases (41). The relationship among SP-A genetic polymorphism, the degree of higher order SP-A oligomerization, and susceptibility to pregnancy complications would be worthy of further studies. The next question under investigation was how SP-A–induced changes within the amnions observed in this study could be explained in the context of human labor. The reduced SP-A distribution in the placental amnion with labor is consistent with the over-expression of IL-1β mRNA in the amnion. IL-1β mRNA expression with labor was higher in the placental amnion rather than in the reflected amnion (2). Therefore, it can be argued that the decreased SP-A in the placental amnion might be a part of the mechanism involved in upregulation of IL-1β mRNA. However, increased amniotic fluid SP-A by itself does not seem to be a prerequisite for the initiation of human parturition for two reasons: 1) we found clear examples of women not in labor with barely detectable high molecular mass SP-A oligomers in the placental amnion, and we observed cases of women in labor with barely detectable high molecular mass SP-A oligomers in the reflected amnion; and 2) SP-A knockout mice undergo spontaneous labor at term. Because SP-A is a lectin, it is possible that there is functional redundancy, and that SP-A is not essential for the onset of labor (42). It is interesting that SP-A also downregulates CXCL2 and CXCL5 mRNA expression. CXCL2 and CXCL5 are potent neutrophil chemokines, and the pattern of regulation by SP-A is not consistent with the enhanced neutrophil chemotaxis reported in other studies (43, 44). It should be noted that TLR2 and TLR4 show intra-amniotic (epithelium versus mesoderm) differences in their expressions. The reasons why TLR2 and TLR4 show reciprocal expression patterns between the amnion epithelium and mesoderm needs further investigation, but it strongly suggests that the functional requirements of the amnion epithelium facing the amniotic cavity and the mesoderm facing the chorion (endometrial cavity side) are different. Although the importance of SP-A–induced amniotic fluid macrophage activation was proposed in mice, the rarity of macrophages in human amniotic fluid along the continuum of gestational age does not support a mechanistic relationship between the initiation of labor and the trafficking of amniotic fluid fetal macrophages. Previous clinical studies have also shown that amniotic fluid macrophages increase under a pathologic condition, such as fetal open neural tube defects, and are rare or absent in normal pregnancies (45, 46). We were not able to demonstrate an increase in myometrial macrophage density or a directional migratory pattern of macrophages in the myometrium or the fetal membranes of C57BL/6 mice. Therefore, although fetal or maternal macrophage infiltration has been described as one of the major changes in the myometrium associated with labor both in humans and other animal species (19, 47, 48), a more thorough evaluation and systematic analysis would be necessary to confirm whether such macrophage migration precedes labor. There are preexisting tissue macrophages in the uteroplacental compartment, and activation of these macrophages would be more effective and biologically relevant if a functional involvement of macrophages is necessary for the initiation of labor. It is noteworthy that Mackler et al. (49) reported a decline in the number of C3/HeN mouse myometrial macrophages before birth compared with day 15 of pregnancy. SP-A was shown to be a signal for a proinflammatory response in mouse parturition (19), whereas several studies have shown its anti-inflammatory, protective role in pulmonary inflammation. SFTPA knockout mice showed defects in pulmonary bacterial clearance and bacterial uptake by alveolar macrophages, whereas proinflammatory cytokines, TNF-α and IL-6, were increased upon intratracheal administration of group B Streptococcus and Haemophilus influenzae when compared with wild types of animals (50). The analysis of alveolar macrophages of Sprague-Dawley rats, CD14-null 129J, or C3H/HeJ mice demonstrated CD14-independent inhibition of LPS-induced TNF-α, IL-1α, and IL-1β mRNA expressions by SP-A (51). It is important to note that alveolar macrophages are a prototypic example of alternatively activated macrophages, and SP-A exerts anti-inflammatory responses of these macrophages characterized by decreased NADPH oxidase activity and reactive oxygen intermediates production (52). TLR2 and TLR4 signaling are also dampened in SP-A–treated macrophages with decreased phosphorylation of IκBα (53). Sequestration of oligomeric SP-A to the reflected amnion seems to explain, in part, a decrease in amniotic fluid SP-A concentration during labor (Fig. 9). The amnion represents an extrapulmonary source of amniotic fluid SP-A (15, 16). The present study reveals a novel example of how a collectin molecule in the amniotic fluid can orchestrate its biologic effect on the chorioamniotic membranes. Amniotic fluid and the amnion compose an environment similar to the case of the lung (54) in the context of SP-A interaction among the amniotic fluid, placental amnion, and reflected amnion. 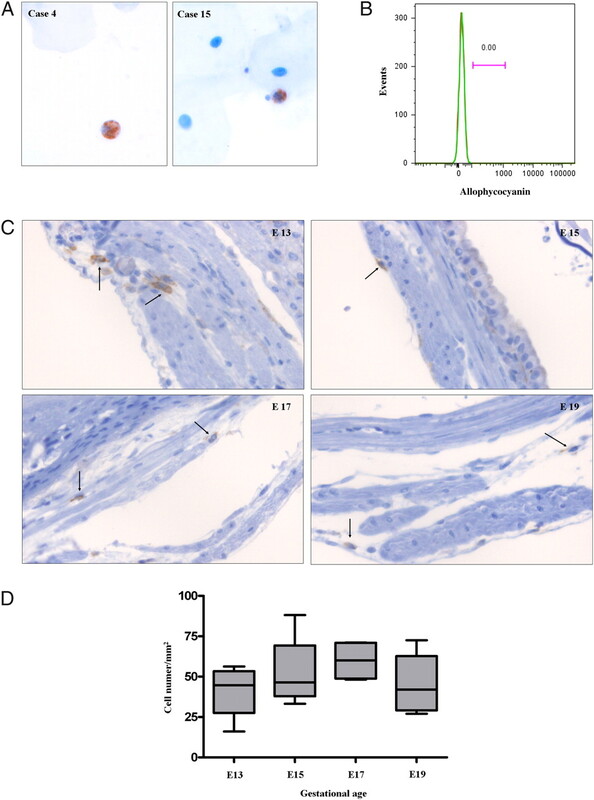 We propose that amniotic SP-A protects the integrity of the amnion and amniotic cavity from proinflammatory stimuli during pregnancy, just as it protects the lung from alveolar inflammation. Yet, SP-A and fetal macrophages in the amniotic fluid per se do not seem to be molecular or cellular prerequisites for parturition in humans. A schematic representation of SP-A dynamics among the amniotic fluid, placental amnion (amnion overlying the placental disc), and the reflected amnion (amnion of the extraplacental chorioamniotic membranes). There is a redistribution of SP-A in the amniotic fluid and the amnion with labor. High molecular mass SP-A oligomers are more abundant in the placental amnion compared with the reflected amnion before labor. With labor at term, increased binding of high molecular mass SP-A oligomers to the reflected amnion results in a decrease of amniotic fluid SP-A. Decreased amniotic fluid SP-A concentration during labor (23) is consistent with this model. We thank Dr. Jeffrey A. Whitsett (University of Cincinnati College of Medicine) for providing SP-A and for critically reviewing the manuscript. ↵1 R.R. and J.-S.K. are co-senior authors. This work was supported by the Perinatology Research Branch, Division of Intramural Research, Department of Health and Human Services, Eunice Kennedy Shriver National Institute of Child Health and Human Development, National Institutes of Health. at term not in labor.
. 2006. Human spontaneous labor without histologic chorioamnionitis is characterized by an acute inflammation gene expression signature. Am. J. Obstet. Gynecol. 195: 394.e1–24.
. 2008. Region-specific gene expression profiling: novel evidence for biological heterogeneity of the human amnion. Biol. Reprod. 79: 954–961.
. 2000. Fetal membrane distention: determination of the intrauterine surface area and distention of the fetal membranes preterm and at term. Am. J. Obstet. Gynecol. 182: 128–134.
. 2008. 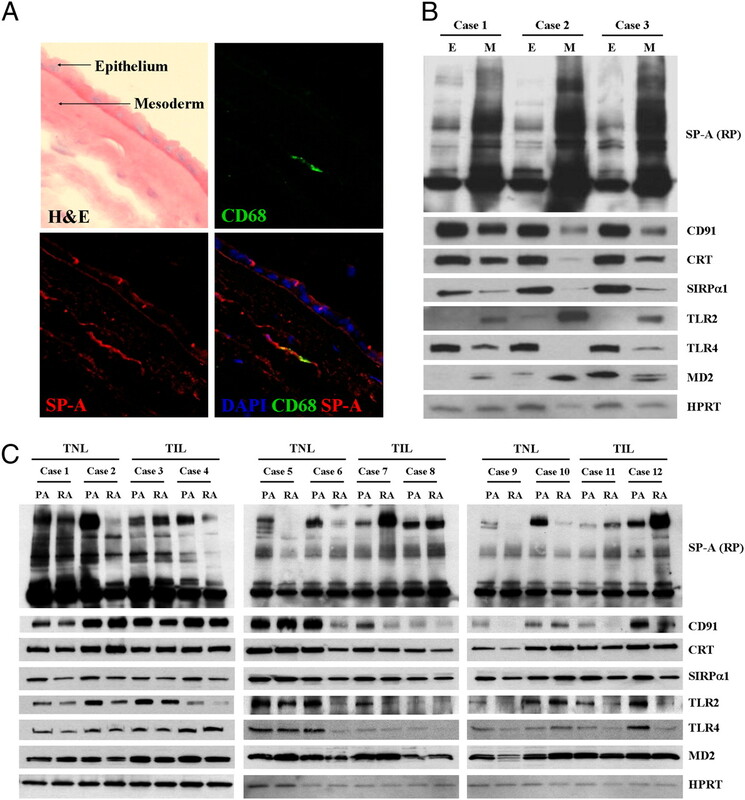 Prostaglandin H synthase-2 gene regulation in the amnion at labour: histone acetylation and nuclear factor kappa B binding to the promoter in vivo. Mol. Hum. Reprod. 14: 53–59.
. 1989. Interleukin-1 stimulates prostaglandin biosynthesis by human amnion. Prostaglandins 37: 13–22.
. 1997. Tumor necrosis factor-alpha promotes sustained cyclooxygenase-2 expression: attenuation by dexamethasone and NSAIDs. Prostaglandins 54: 727–743.
. 1992. Amnion cell biosynthesis of interleukin-8: regulation by inflammatory cytokines. J. Cell. Physiol. 153: 38–43.
. 2008. Inflammatory processes in preterm and term parturition. J. Reprod. Immunol. 79: 50–57.
. 1994. Characterization of mRNA transcripts and organization of human SP-A1 and SP-A2 genes. Am. J. Physiol. 266: L354–L366.
. 1998. Differential regulation of SP-A1 and SP-A2 genes by cAMP, glucocorticoids, and insulin. Am. J. Physiol. 274: L177–L185.
. 2006. Surfactant proteins SP-A and SP-D: structure, function and receptors. Mol. Immunol. 43: 1293–1315.
. 2007. Pulmonary collectins in innate immunity of the lung. Cell. Microbiol. 9: 1871–1879.
. 2003. Expression and localization of lung surfactant protein A in human tissues. Am. J. Respir. Cell Mol. Biol. 29: 591–597.
. 2004. Surfactant protein A, an innate immune factor, is expressed in the vaginal mucosa and is present in vaginal lavage fluid. Immunology 111: 91–99.
. 2006. Induction of surfactant protein A expression by cortisol facilitates prostaglandin synthesis in human chorionic trophoblasts. J. Clin. Endocrinol. Metab. 91: 4988–4994.
. 2007. Surfactant protein-A mRNA expression by human fetal membranes is increased in histological chorioamnionitis but not in spontaneous labour at term. J. Pathol. 211: 489–496.
. 1991. Ontogeny of surfactant proteins A and B in human amniotic fluid as indices of fetal lung maturity. Pediatr. Res. 30: 597–605.
. 1994. Surfactant proteins A (SP-A) and D (SP-D): levels in human amniotic fluid and localization in the fetal membranes. Biochim. Biophys. Acta 1210: 303–307.
. 2004. Surfactant protein secreted by the maturing mouse fetal lung acts as a hormone that signals the initiation of parturition. Proc. Natl. Acad. Sci. U.S.A. 101: 4978–4983.
. 2005. New insights into the molecular endocrinology of parturition. J. Steroid Biochem. Mol. Biol. 93: 113–119.
. 2006. Fetal macrophages are not present in the myometrium of women with labor at term. Am. J. Obstet. Gynecol. 195: 829–833.
. 2008. Vascular and myometrial changes in the human uterus at term. Reprod. Sci. 15: 59–65.
. 2008. The concentration of surfactant protein-A in amniotic fluid decreases in spontaneous human parturition at term. J. Matern. Fetal Neonatal Med. 21: 652–659.
. 2003. Direct binding of Toll-like receptor 2 to zymosan, and zymosan-induced NF-kappa B activation and TNF-alpha secretion are down-regulated by lung collectin surfactant protein A. J. Immunol. 171: 417–425.
. 2002. Cutting edge: the immunostimulatory activity of the lung surfactant protein-A involves Toll-like receptor 4. J. Immunol. 168: 5989–5992.
. 2004. Toll-like receptor-2 and -4 in the chorioamniotic membranes in spontaneous labor at term and in preterm parturition that are associated with chorioamnionitis. Am. J. Obstet. Gynecol. 191: 1346–1355.
. 2003. By binding SIRPalpha or calreticulin/CD91, lung collectins act as dual function surveillance molecules to suppress or enhance inflammation. Cell 115: 13–23. 2005. Limma: linear models for microarray data. In Bioinformatics and Computational Biology Solutions using R and Bioconductor. Gentleman R., V. Carey, S. Dudoit, R. Irizarry, W. Huber, eds. Springer, New York, pp. 397–420.
. 1995. Controlling the false discovery rate: a practical and powerful approach to multiple testing. J. R. Stat. Soc., B 57: 289–300. 2004. Using GO for statistical analyses. In Compstat 2004 Proceedings in Computational Statistics. Antoch J., ed. Springer, Prague, pp. 171–180.
. 2007. A systems biology approach for pathway level analysis. Genome Res. 17: 1537–1545.
. 2009. A novel signaling pathway impact analysis. Bioinformatics 25: 75–82.
. 1998. A novel method of purifying lung surfactant proteins A and D from the lung lavage of alveolar proteinosis patients and from pooled amniotic fluid. J. Immunol. Methods 220: 139–149. 2003. Proteomic analysis of human bronchoalveolar lavage fluid: expression profiling of surfactant-associated protein A isomers derived from human pulmonary alveolar proteinosis using immunoaffinity detection. Proteomics 3: 87–94.
. 2008. Coexpression of myofibroblast and macrophage markers: novel evidence for an in vivo plasticity of chorioamniotic mesodermal cells of the human placenta. Lab. Invest. 88: 365–374.
. 2005. Role of the degree of oligomerization in the structure and function of human surfactant protein A. J. Biol. Chem. 280: 7659–7670.
. 1984. Macrophage populations in the human placenta and amniochorion. Clin. Exp. Immunol. 57: 393–403. 1998. Formation of the placenta and extraembryonic membranes. Ann. N. Y. Acad. Sci. 857: 23–32.
. 1992. Murine pulmonary surfactant SP-A gene: cloning, sequence, and transcriptional activity. Am. J. Physiol. 263: L546–L554.
. 2005. Association of polymorphisms in pulmonary surfactant protein A1 and A2 genes with high-altitude pulmonary edema. Chest 128: 1611–1619.
. 1998. Surfactant protein A (SP-A) gene targeted mice. Biochim. Biophys. Acta 1408: 296–302.
. 2003. Surfactant protein A differentially regulates peripheral and inflammatory neutrophil chemotaxis. Am. J. Physiol. Lung Cell. Mol. Physiol. 284: L140–L147.
. 2001. Surfactant protein A recruits neutrophils into the lungs of ventilated preterm lambs. Am. J. Respir. Crit. Care Med. 163: 158–165.
. 1987. Immunocytochemical characterization of amniotic fluid macrophages in cases of fetal neural tube defects. Am. J. Clin. Pathol. 87: 37–42.
. 1988. Neutral-red uptake and expression of monocytic antigens in amniotic-fluid mononuclear phagocytes: evaluation of a novel approach for prenatal diagnosis of neural-tube defects. Am. J. Reprod. Immunol. Microbiol. 18: 81–86.
. 1999. Leukocytes infiltrate the myometrium during human parturition: further evidence that labour is an inflammatory process. Hum. Reprod. 14: 229–236.
. 2008. Monocyte chemoattractant protein-1 (CCL-2) integrates mechanical and endocrine signals that mediate term and preterm labor. J. Immunol. 181: 1470–1479.
. 1999. Macrophage trafficking in the uterus and cervix precedes parturition in the mouse. Biol. Reprod. 61: 879–883.
. 2000. Distinct effects of surfactant protein A or D deficiency during bacterial infection on the lung. J. Immunol. 165: 3934–3940.
. 2004. Surfactant protein A inhibits alveolar macrophage cytokine production by CD14-independent pathway. Am. J. Physiol. Lung Cell. Mol. Physiol. 286: L129–L136.
. 2004. Pulmonary surfactant protein a inhibits macrophage reactive oxygen intermediate production in response to stimuli by reducing NADPH oxidase activity. J. Immunol. 172: 6866–6874.
. 2008. 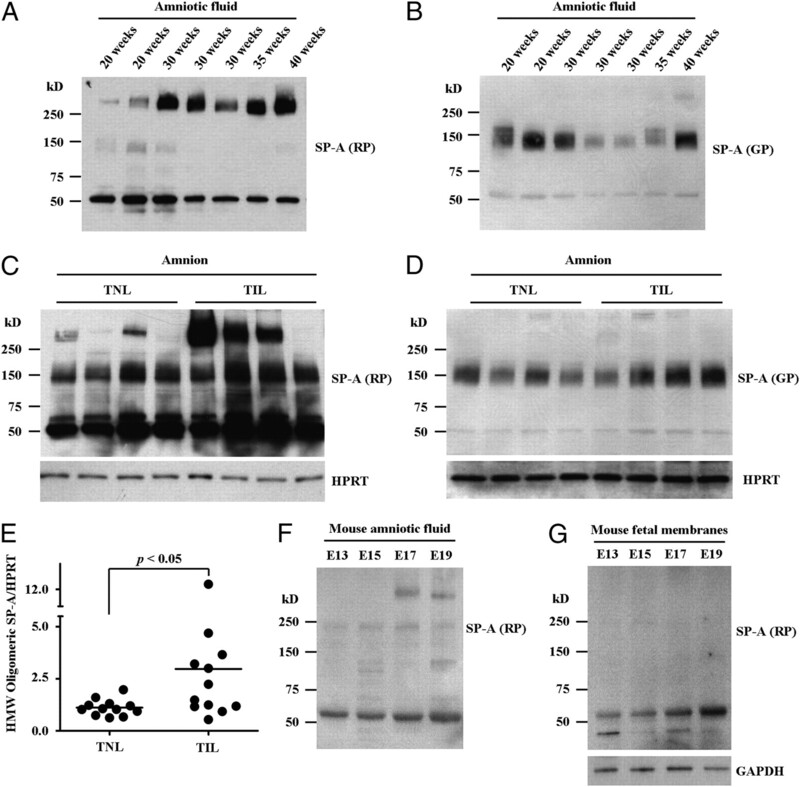 Pulmonary surfactant protein A regulates TLR expression and activity in human macrophages. J. Immunol. 180: 7847–7858.
. 1999. SP-A as a cytokine: surfactant protein-A-regulated transcription of surfactant proteins and other genes. J. Cell. Physiol. 178: 379–386.